Breathe Spa & Salon offers Destinations Medical Spa services. Licensed M.D.’s and R. N.’s perform medical cosmetic treatments in the comfort and privacy of our treatments rooms. Ask your stylist or technician to schedule a free consultation. New clients just call 714-968-8811 for your free consultation! Complexion Blending and Brightening – We use the state of the art Cutera intense pulsed light system (IPL) to erase superficial skin damage without disrupting the skin surface. We have the recently introduced Limelight hand piece which is capable of three different programs: one to erase fine veins and generalized redness, another to eliminate brown spots, and a third that can tackle BOTH problems. Photo Genesis can treat just about any area of the body safely, comfortably, and effectively – without the need for messy gels or numbing creams. By heating the dermis on a deeper level than Photo Genesis, Laser Genesis stimulates collagen regrowth. As new collagen builds up, stubborn wrinkles around the mouth, on the cheeks, and around the eyes start to soften. Diffuse redness (rosacea) also diminishes as Laser Genesis closes the dilated capillaries responsible for this condition. Laser Genesis can also improve the appearance of scars, including those caused by acne. The treatment feels relaxing and therapeutic and requires no topical anesthetics, The Cutera LaserGenesis uses the 1064 wavelength making the treatment suitable for people of all colors including those with tanned skin. Titan uses infrared light to heat the dermis well below the skin surface. For areas of the body starting to show skin laxity such as the cheeks, jaws, neck, arms, and abdomen, Titan produces an immediate increase in skin tone and your results will continue to improve over several months! Diminish sagging jowls and “turkey necks” without the pain of other treatments such as Thermage. As you can see from our before and after pictures, Titan can produce results once only obtained by dermal fillers or facelift. The most powerful combination of light and laser therapy addresses all of the most common conditions of aging: age spots, sun damage, fine lines and wrinkles, and lax and sagging skin. By combining Photo Genesis, Laser Genesis, and Titan, your skin will be treated at the superficial as well as the deeper layers. We may not be able to stop the passage of time, but with 3D Skin Rejuvenation, you will look as if you have! Treatments typically occur once every four weeks and are customized to your individual needs. We use the Cutera Cool Glide laser to remove unwanted hair on skin of ALL colors – even tanned skin! Unlike other lasers, the Cool Glide can treat the fine hair on a woman’s upper lip as well as the coarse hair on a man’s back. It is also one of the most comfortable lasers on the market today. Because hair is only affected by the laser during its growth cycle, permanent hair reduction requires multiple treatment sessions. The number of treatments and interval between treatments varies with the specific area of the body and with your individual hair texture. Tired of those tiny red spider veins or those deeper blue reticular veins on your face or legs? The Cool Glide 1064 laser is the right wavelength to eliminate them – on people of any color! Frustrated with over the counter acne remedies that don’t work? We believe even the most stubborn cases of acne can be tamed. BoTox is an extremely dilute form of botulinum toxin which when injected into the muscle weakens but does not paralyze them. 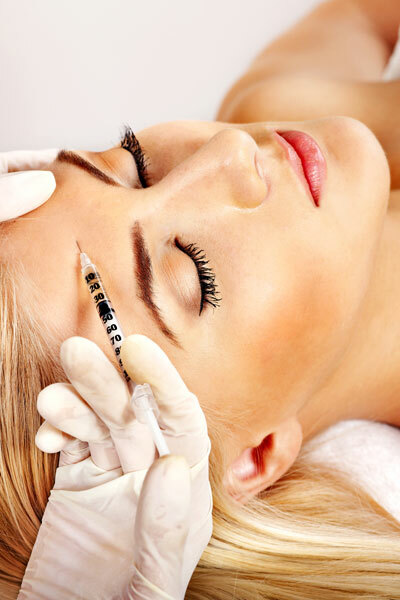 Safe and efficacious, BoTox is the number one cosmetic procedure in the United States. Over 2 million treatments were given in 2005. To remove or reduce wrinkles that form between your brows, on your forehead, or around your eyes when you laugh, smile, or frown, BoTox Cosmetic can work like magic. One ten minute treatment – a few tiny injections – will relax the muscles that cause those lines to form and keep them relaxed for up to four months. At Destinations Medical Spa, we don’t over treat you. You’ll still look like you… only better! Restylane is cosmetic dermal filler made of non-animal derived hyaluronic acid. Hyaluronic acid is a natural substance that already exists in the human body and provides volume and fullness to the skin. No allergy test is required for administration of Restylane. The drug is FDA approved for treatment of facial wrinkles. It is also an excellent choice for restoring youthful fullness to the lips. For patient comfort, Restylane is usually administered following a nerve block or local anesthetic. Some redness and swelling should be expected for 2 days after the procedure. Results last up to 6 months. Cosmoderm is a bio-engineered human collagen. Because it is a substance natural to the human body, no skin test is required. Cosmoderm can be injected into any wrinkles that appear when the face is at rest. It is combined with the anesthetic lidocaine so requires no “pre-numbing” shots or nerve blocks. It is excellent at filling the deep lines that from your nose to the corners of your mouth or between your brows. The effects last 50% longer than animal derived collagen (Zyderm): in the average, 4 months before correction starts to fade. Copyright © 2019 Salon Website Design by StyleNet. All rights reserved.